A Victoria Allison Jewelry original! This keychain features an antiqued rose gold working compass. 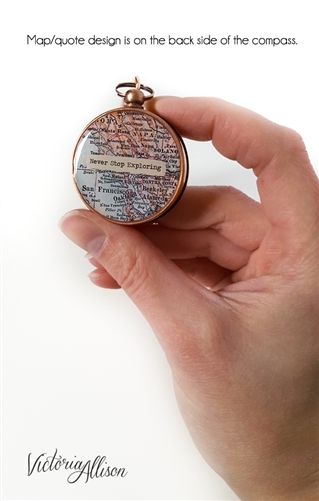 The back of the compass displays an antique map print of the city of your choice, with an overlay of your own personalized quote (on tea stained paper,) sealed under glossy jeweler's resin. 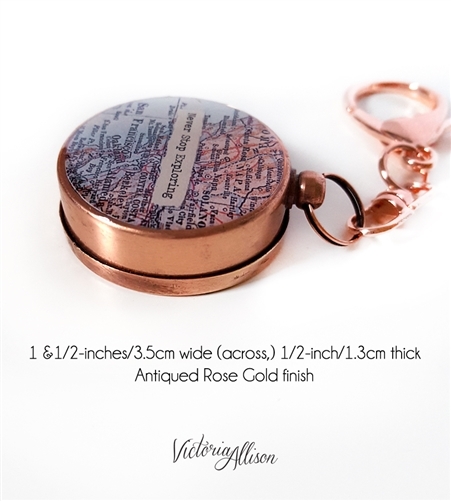 The antiqued rose gold vintage-styled magnetic compass measures approximately 1 1/2-inches/3.5cm wide (across,) and is a little under 1/2-inch/1.3cm thick (depth.) The compass is new, but the rose gold plated finish has been lightly antiqued to make it appear aged. 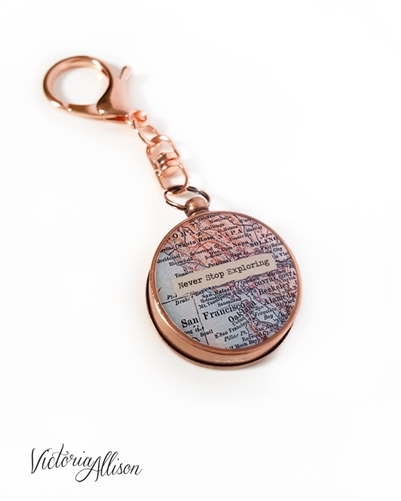 The lobster-style keychain is shiny rose gold plated. 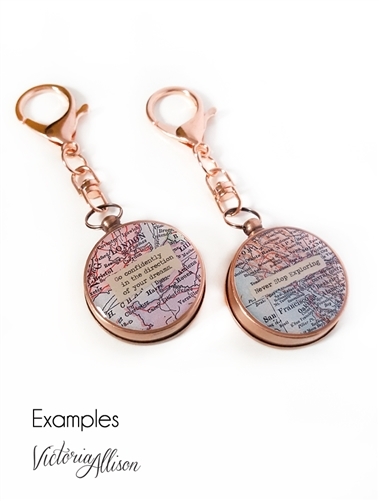 The total length from the top of the keychain to the bottom of the compass is 4-inches/10.16cm. 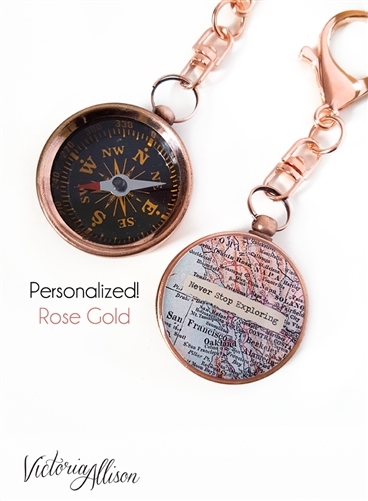 Your map/quote on the back of the compass will be sealed with an acrylic jeweler's resin for a hardened glossy finish. You may choose from one of the popular cities shown in the samples, or pick your own. 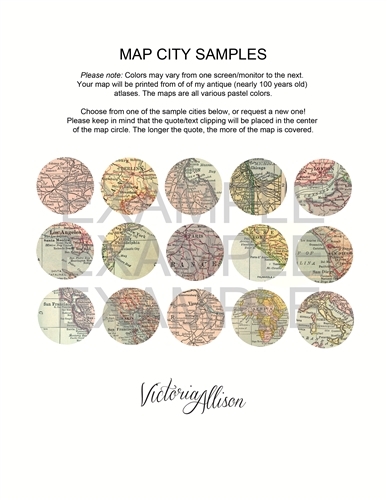 ***Please note that these maps are printed from my own antique atlas collection. The atlases are nearly 100 years old and sadly do not include *all* cities, so some small towns may not be available. *** Not sure? Send me a email first and I'll be happy to check for you! All major cities are available. Unfortunately I cannot offer street addresses or landmarks. You may choose a special quote, saying, birth date, initials, coordinates, anything you can dream up, and I will print it onto paper which I have hand tea-stained. Keep in mind that space is limited. Shorter quotes/phrases fit best. If no customized quote/text is entered, I will make this design for you with the "Never Stop Exploring" quote as shown in the first photo. Care instructions: To protect the inner components of the compass, please keep it dry.